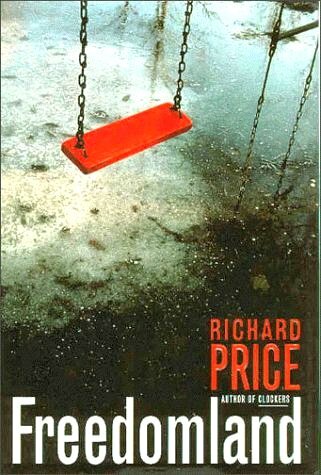 Freedomland, Richard Price’s 1998 novel of racial strife packaged as a kidnapping mystery-thriller, seems destined to age into the reputation of being “just as relevant now as it was the day it was published.” When it first came out it was critiqued as a commentary on the racially charged cultural firestorms of the preceding decade, one of which in particular provided the initial inspiration for the book’s story. (Saying which one would kind of constitute a spoiler, but click here and go down to the third paragraph if you’re interested.) Today you could just as easily view it in the context of the “Black Lives Matter” protests–though if I were writing this blog last year, the obvious point of reference would’ve been Trayvon Martin and the George Zimmerman trial. Presumably by next year the book’s themes may have been echoed in yet another tragedy. Freedomland attempts to examine the self-perpetuating cycle through which America fears and abuses its poor black citizens, and in that regard it’s sadly unlikely to start feeling dated anytime soon. The story begins with Brenda Martin, a white single mom from the fictional New Jersey suburb of Gannon, arriving at a hospital bleeding and dazed, claiming to have been carjacked in the notorious Armstrong housing projects of neighboring Dempsy (the city Price invented for his previous novel, Clockers). Her four-year-old son Cody was in the back seat, she says; the perpetrator she can only describe as a generic African-American male. Like Clockers, the book alternates back and forth between the perspective of a cop assigned to the case and that of a civilian who gets drawn into it; in this case the co-protagonists are Det. Lorenzo Council, a black Armstrong native whose status as neighborhood peacekeeper is put to the test by the police and media frenzy that begins to build around Cody’s kidnapping, and Jesse Haus, a white local journalist who latches onto Brenda opportunistically but finds herself genuinely sympathizing with the mother’s plight. Although Price returns to Dempsy for this story, Clockers fans shouldn’t expect any where-are-they-now glimpses of Rocco or Strike, or of literally any character from the earlier novel. There are a couple references to the Roosevelt Houses, Strike’s old stomping grounds, but that’s pretty much it as far as call-backs go. In some cases Price even seems to go out of his way to avoid connecting the two books: Both feature abandoned hospitals, but the one in Clockers was called the “Anne Donovan Pediatric Center,” while Freedomland pays a visit to the “Chase Institute.” And Clockers at one point mentions a neighboring white community that strictly polices its border with Dempsy but also serves as a source of customers for the project dealers–seemingly a prototype for Gannon but referred to as “Rydell.” This total disinterest in world-building is a bit disappointing for me as a connect-the-dots geek, but it befits a writer drawn more to character and environment than intricate plot construction. Dempsy is a device that allows Price to universalize his stories by removing them from a strictly real setting, not a contemporary Middle-earth to be obsessively mapped out and populated. I said in my Clockers post that one of the things that made that book stand out was that its characters more or less accepted the horror of the milieu they were in and tried to work within it; they had no conception of the possibility of changing it. Freedomland imagines a scenario that pushes even jaded Dempsy projects residents to such a point that they feel forced to rise up, but, this being a Richard Price novel, that rebellion isn’t depicted in terms of righteous rage or hopeful joy so much as the queasy anxiety it evokes in Lorenzo. Nicknamed “Big Daddy” by the people he polices, his primary motivation is to protect them, but as the police crackdown in Armstrong gets more and more harsh, he has to question what protection really means: If he helps to defuse their potentially violent outrage about the abuse the city is heaping on them, is he also helping to allow that abuse to continue? It’s a question that’s hovered over the Ferguson protests and the attendant urges to “keep calm,” and it receives no easy or concrete answers here. But Dempsy’s Gothically broken-down atmosphere isn’t as scary as the emotional ordeal we see Brenda going through. She comes off as a fluttery, fragile person by nature, and Price thoroughly details how the unimaginably painful experience of losing her son breaks her psychologically: She alternates between mania and practical catatonia, cuts her hair on impulse, says things like “I can die. I can see dying.” And because we’re led to suspect that she may be somehow responsible for what’s happened to Cody, we can never fully sympathize with her, which only makes her situation all the more brutal: She’s forsaken even by the author and readers of her own story. In fact, the intensity of Brenda’s story may be Freedomland‘s biggest strength and biggest flaw simultaneously. On the one hand, it’s a testament to Price’s ability to render characters that feel real and have a visceral effect on the reader. But, on the other hand, the extensive focus on Brenda takes attention away from how her story affects life in the Armstrong projects–essentially the same mistake for which the book criticizes society at large. Part of the problem is that we never really get a perspective from within Armstrong; Lorenzo’s immersed in that community, but his responsibilities as a cop also mean that he has to straddle the line between it and the outside world, serving as both a protector and an enforcer. Devoting more chapters to how the investigation affects, say, one of Armstrong’s “jugglers” (this book’s slang for drug dealers, “clockers” apparently having gone out of style sometime in the previous six years) might have provided some balance, although it’s possible Price felt that would’ve been too much like repeating himself. But the story still provides a nuanced if necessarily incomplete exploration of issues that are and will continue to be crucial to American society. And, in the context of Price’s body of work, Freedomland is significant because it established that his interest in poverty, race and crime wouldn’t just be a one-off thing; he’s focused on those themes in both of the novels that have followed this one, and his facility with them would be key to his involvement with The Wire. • Freedomland gets its name from an old Bronx amusement park which was briefly mentioned in earlier Price novels like Bloodbrothers and The Breaks and which is described here as having inspired a Dempsy rip-off called Freedomtown, where some key scenes take place. The metaphorical nod to the illusory nature of America’s ideals should be obvious, although why the book wasn’t called Freedomtown I couldn’t really say. • Like Clockers, Freedomland opens with a Bible quote, a habit Price seems to have picked up from Hubert Selby Jr.’s Last Exit to Brooklyn. • Brenda’s story about her mother giving her the silent treatment and then saying “Just remember this the next time you think I shouldn’t love you so much” is nearly identical to a story Kenny tells about his own childhood in Ladies’ Man. • Fans of The Wire will recognize Lorenzo’s wearied mental reference to “sweeping leaves on a windy day” from the episode “All Due Respect,” for which Price wrote the teleplay. • In 2006, Freedomland would be brought to the big screen by Streets of Gold director Joe Roth. Next week: Richard Price co-writes another project that tackles American racial anxieties, though from a very different angle: The 2000 Samuel L. Jackson remake of Shaft. This entry was posted in Books and tagged books, crime, fiction, literature, new jersey, novels, richard price. Bookmark the permalink.